Although the majority of the population of Iran subscribe to Islam and it is located in the Middle East, the people of Iran can trace their ancestry back to ancient Persian lines. Persian, rather than Arabic, is the dominant language, and many of the customs retain elements of Persian Zoroastrianism. 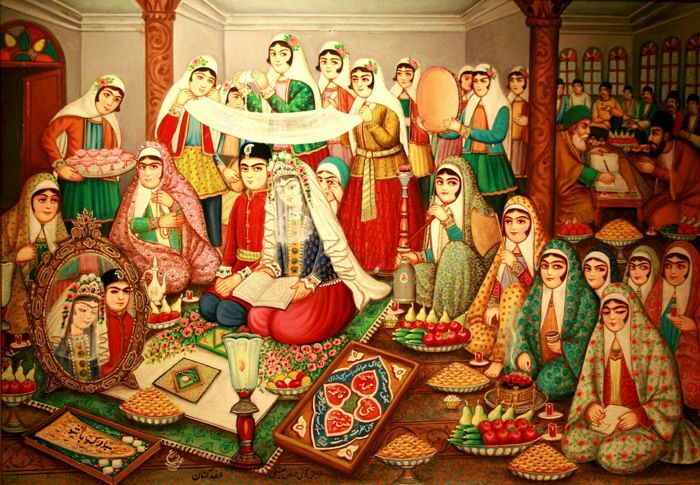 Although the sacred parts of the wedding ceremony, such as the reading of religious passages, are now conducted in the traditional Muslim way (with readings from the Quran as well as blessings such as the Kitbah), there are many aspects that still reflect ancient Iranian heritage. Weddings in Iran are very expensive affairs; and there are more weddings in the countryside than there are in rural areas, even though those living in cities tend to have more economic security. 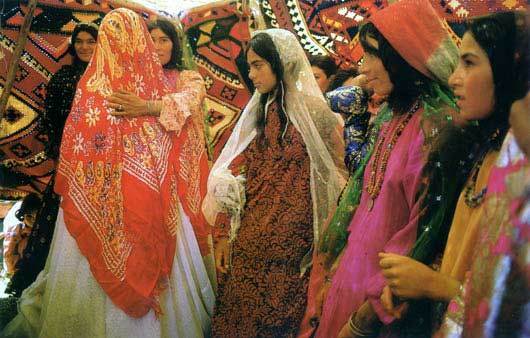 Iranian weddings are meant to be very public celebrations, taking place in front of as many people as possible. Bride prices are perhaps higher in Iran than in any other Muslim country; they are so high in fact that to many, they are almost prohibitive. The cost for a bride includes not only gifts for her and her family, but also the entire cost of the reception, which as mentioned is typically very large and very long. In order to offset these costs, many Iranian couples are no longer having the traditional large ceremony, instead electing the Muslim equivalent of eloping (the marriage is still blessed by the imam, but there is no contract. This is usually very hard on the bride, who must bear the wrath of her parents). Another way in which Iranians are offsetting the cost of nuptials is by getting married in a ceremony involving two, three, or more other couples. This way, the costs are shared by all. Both ceremony and reception take place at the house of the bride’s parents. The ceremony is started when the guests begin arriving. • Spread.The elaborate cloth placed underneath the set up on the floor is passed down from mother to daughter. It is made of expensive cashmere, satin, or silk, and is embroidered. • A tray of herbs and spices. There are seven different elements on this tray, each with a different color. The herbs and the colors are said to ward off evil spirits. • Mirrors and candles. A mirror is placed in front of where the couple will sit, with two candles on either side. This arrangement again symbolizes light, and the candles unity. The bride sits down veiled but then removes the veil, and so the first thing a groom sees at the table is a reflection of his bride. • Fertility symbols. Several types of nuts in shells as well as eggs are placed on the spread to symbolize the wishes of a fertile union. This is called the tokhmé morgh. 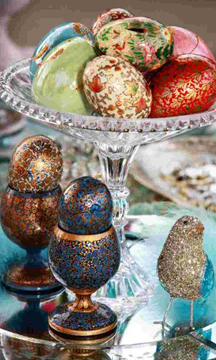 The eggs are often often beaded or painted gold. Also, nuts such as almonds, walnuts and hazelnuts are painted gold. • The Quran. A copy of the Quran is opened to the middle and placed in the center of the spread. A prayer rug and prayer kit is also placed on the center of the spread. • Coins and various sweets. A bowl of coins is used to bring wealth, and there are several sweet pastries that represent the sweetness of the new life and also to share with guests. During the ceremony, the bride and groom often have the sugar from special sugar cones shaved off by guests and onto their heads. This is thought to bring good fortune, as well as representing a wish that their new life will be filled with joy (sweetness). The bride will keep these cones as souvenirs and for good luck.